The schedule says I should be planting the broccoli, spinach, and peas this weekend. I think the weather might say something else. This week, I have been cutting, bending, and placing the conduit for holding the trellis netting and deer net. More on that tomorrow. 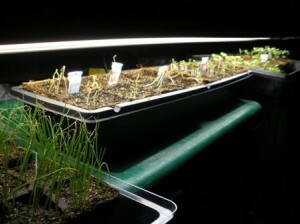 I have also been adjusting the plant locations under the grow light to keep each set in the optimum location. I start the seeds in the kitchen using a warming mat, and move them to the basement under a grow light once they germinate. The grow light is a basic shop light with one “warm” and one “cool” bulb. Underneath, I have a few trays sitting on various boxes and tubs, which I use to adjust the height to keep each plant within about two inches from the bulbs. I am planning on mixing the soil tomorrow so I can plant on Sunday, but we will see what happens. I broke down picked up a seed warming mat at Earl May today. Waiting to see how much of a difference it makes.